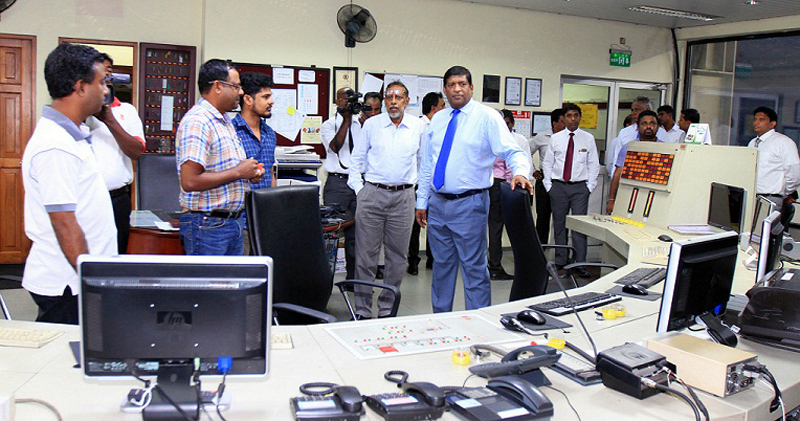 Power, Energy and Business Development Minister Ravi Karunanayake at the Kelanitissa power plant yesterday. The government will provide durable solutions to the present power crisis in three stages, Power, Energy and Business Development Minister Ravi Karunanayake said. Solutions will be sought sought under short, mid and long term strategies which expects to add additional megawatts to the national grid. The Minister addressing media during his inspection visit to the Kelanitissa power plant yesterday said under the long-term programme, it is expected to add 3,000 to 3, 500 megawatts to the national grid. “This programme has been presented before Parliament last week and will be presented before the Cabinet for approval next week,” the minister said. The planned mid-term solutions include the execution of the power plants, which are under renovation at present. Under the short term solutions, it is expected to add 500 to 600 megawatts to the national grid and also to generate or obtain electricity to fulfill the prevailing annual deficiency of 300 megawatts. The Minister also said the country had to face such a power crisis due to the absence of proper plans to generate additional 500 to 600 megawatts from the Kelanitissa power plant. However, long-term plans on power will be drafted in discussion with the relevant sections in the future, he said. The minister assured an uninterrupted power supply from April 10 onwards, requested the public to use the power sparingly during the next three to four months until the prevailing critical situation ends.